Since Wareable launched in 2014, heart rate - the testing, accuracy and validity of - has been a major through-line. In fact, these days it's hard to find a fitness tracker or smartwatch that doesn't have some type of heart rate monitoring in it. When we head out running or cycling with these devices, heart rate accuracy is always a consideration, and more often than not it falls down when put up against more established and reliable methods. Part of the problem is location; we hear time and time again that while the wrist is a good place to put a screen, it's also one of the worst spots for keeping a continuous and accurate HR reading. This presents a tough challenge for companies. And in fairness, more are matching up to the chest strap, which is still the gold standard for BPM. So where is the best place to track heart rate? We pulled in the expert advice from Valencell - maker of heart rate sensors - and Firstbeat - which analyzes heart rate data and provides its secret sauce to copious sports watches - to break it down. What's so bad about the wrist anyway? 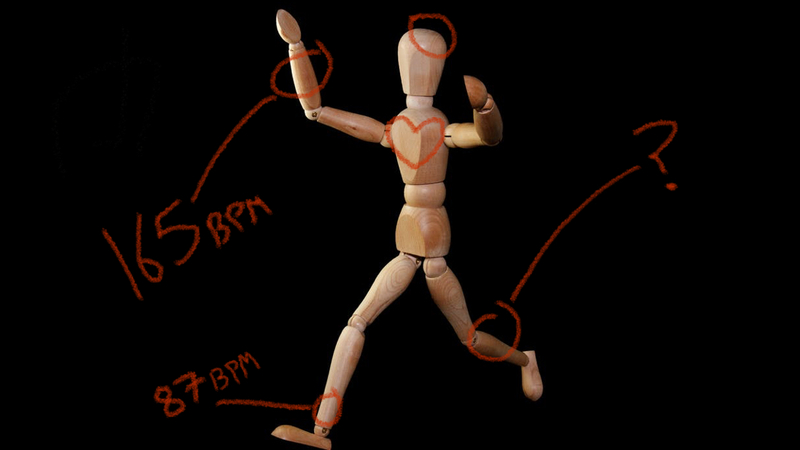 Ok, so we already know the wrist isn't a good place for tracking heart rate - but why? Easy for you to say. PPG sensors fire optical light through the skin and measure how much bounces back. It then uses algorithms to work out how blood is being pumped around by the heart. If you're using a heart rate sensor that emits light, you're probably using PPG. These sensors measure electrical signals from the heart by putting electrodes on the skin. Chest-worn monitors use ECG. If you've ever worn one, you may have been told to moisten the sensors to ensure a smooth flowing current. "There are certain limits with wrist-worn sensors which may be very difficult to push beyond a certain level," says Ilkka Korhonen, VP of technologies at FirstBeat, "because the motion artifacts are so major in the hand when you are using it for doing something." The wrist is a great place for a user interface, but according to both Korhonen and Valencell CEO Steven LeBoeuf, the wrist is one of the worst locations on the body for heart rate sensors. The ideal solution, says Korhonen, is to have a screen on the wrist, but as a receiver to sensors worn elsewhere on the body. Some running watches let you do this right now by letting you connect the chest strap to the watch via Bluetooth. "If you could have your smartglasses provide the user interface and that allows you to have the sensor separately, then there are several locations that are better for accuracy," Korhonen adds. What about further up the arm? We've started seeing some devices that actually track from further up the arm. though these have been dedicated monitors, rather than general fitness trackers. The Polar OH1 is one example, as is the Wahoo Tickr Fit, which we found to be more accurate than wrist sensors, even at higher intensities. "The upper arm has significantly less motion artifacts," says FirstBeat's Korhonen. Fun fact: it also has better blood perfusion. In the legs however, blood perfusion is low, says Valencell's Steve LeBoeuf, making it a bad place for tracking heart rate accurately. The muscular structure is also high, with lots of different parts moving all at once. "It makes it very difficult to pull out the signals you care about in the midst of that," he says. But the leg is good for tracking muscle oxygenation. "Because the muscle density is so high, if you take a pulse oximetry type approach to the leg, you can get a good assessment of muscle oxygenation." That's a useful thing to know if you're a runner as you can use muscle oxygenation to understand when you're going into lactate threshold. "You can't do that in just any part of the body," says LeBoeuf, "so there are benefits to being located in the leg, even though the motion artifacts are extreme." You can also get a good assessment of muscle oxygenation on the wrist to some degree, Steve adds. "This is one of the challenging things about measuring SpO2 on the wrist. "You might be aware that Fitbit in the Ionic device has a relative SpO2 sensor, they do not call it an SpO2 monitor. One of the reasons that it's smart they're saying that is because you can't asses SpO2 on the wrist, because it's always convoluted with muscle oxygenation. But that's a benefit if you're trying to assess the muscle oxygenation." According to LeBoeuf, who co-authored a paper on this in 2014, "It's hard to get much better than the ear". The reason being that there's a lot of blood perfusion, in which we're referring to the density of blood flow in the outer layers of the skin. There's a lot of that here. Ever cut your ear and found that it just won't stop bleeding? Exactly. In fact, in the ear there's a bank of arterioles, between the antitragus and concha, which expand with heart beats. Therefore, angled right, a sensor can get a fantastic reading of your heart rate. But there's the rub, because it's not so straightforward to do, and people's anatomies vary. "The optics are more complicated because its three-dimensional optics compared to two-dimensional optics," as LeBoeuf puts it. "And also you need the earbud to fit well. If the earbud is flopping around like a hotdog in a hallway, you're not going to get good readings, but if the earbud is fitting well in the ear you're going to get extremely good readings." In fact, FirstBeat's Korhonen says that for those of its customers that follow its design rules and offer different fits for different ears, the readings can be "bulletproof". "I've seen cases where the ear is literally better than a chest strap throughout even crazy exercises like CrossFit." Another benefit of the ear is that you can measure core body temperature through the tympanic membrane, among other things. Other than anatomical differences, there's another problem with the ear: some people don't want to stick something in their ears. "It blocks your hearing of your surroundings," Korhonen points out. "I feel more safe if I can hear what's happening around me." Nobody like wrapping cold electrodes against their skin before a run, but the chest strap has long been the gold standard for heart rate testing. Why? Quite simply because it's reading right from where your heart is. But unlike most wrist-worn devices these straps use electrocardiography that read electrical signals from your heart. Just make sure those connectors are moist. LeBoeuf says a lot of customers have asked Valencell to integrate heart rate tech into clothing for medical purposes, and a lot of time they like to be located on the chest. This is to allow them to integrate ECG tech, but also for assessing muscle oxygenation. "And that can be really important for cardiac conditions or the onset of cardiac arrest," he says. "The chest area would also be a pretty good location for an optical sensor, not only for an ECG," says Korhonen. The Moov HR Sweat tracks heart rate from the forehead, and when we tested it we found it delivered on accuracy. So is the forehead good - but why? "The forehead is also an amazing place for this," says LeBeouf. "Any place on the head is especially amazing generally speaking as long as the blood perfusion is high enough." And on the forehead you have high perfusion, with thinner skin at your temples. "Another benefit especially true for the forehead is that motion artifacts, depending on where you place it on the forehead, can be extremely small because you don't have anything to worry about. In the ear, when you speak for example, you still have motion artifacts, but you don't even have that to worry about with the forehead." So there you have it. If it's above the neck or on the chest, chances are you're getting an accurate reading, but there are challenges even in those areas. Optical sensors afford more design freedom than ECG, but they also present more challenging cases for measuring heart rate.